United Nations Secretary-General António Guterres addressing the High-Level session of the Katowice Climate Change Conference, COP24, on 3 December 2018. 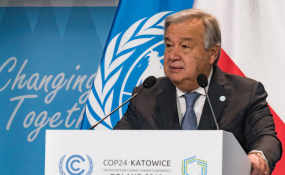 Katowice, Poland — The U.N. secretary-general on Tuesday urged world leaders to use a climate change summit he will host in 2019 to explain how they plan to ratchet up their efforts to reverse worsening global warming that is leading to a "very dramatic situation". Antonio Guterres said the gathering at the United Nations in New York in September would be an "essential piece" in raising ambition to cut heat-trapping emissions, and helping countries cope better with wilder weather and rising seas. "We all know the massive scale of the climate challenge we face," he told reporters at climate talks in Poland. "And we all know we are not on track." In the coming year, U.N. agencies will work with governments to strengthen their climate action plans covering the decade to 2030, as well as their long-term strategies, Guterres said. Climate experts said on Tuesday they expected countries to issue a political declaration at the end of the Dec. 2-14 climate talks in Katowice that would firmly signal their intention to do more to cut emissions from 2020. They should then "sharpen their pencils" and consult with government authorities, businesses and civil society back home to work out how to achieve that, said Alden Meyer, director of strategy and policy for the Union of Concerned Scientists. The world has seen "a technology revolution since Paris", he said, with renewable energy generation and storage now far cheaper - something countries must make the most of in revising their 2020 plans to cut emissions. There are also complex discussions on how rich states should track the funding they have provided and indicate the amount they will contribute in future years - a touchy subject with some governments reluctant to make promises. Guterres said a central objective of his 2019 summit would be to provide a "transparent approach" to delivering $100 billion to vulnerable countries each year from 2020-2025, when a new target is due to kick in. He urged donors to replenish the coffers of the flagship Green Climate Fund by the time of the summit, a process the fund's board has said it aims to complete by October 2019. The summit, designed to spur political commitment to action, will also involve different groups tackling climate change, from cities and companies to young people, the U.N. said in a briefing note. "The summit is not an end in itself," Guterres said. "It is... a tool to leverage unprecedented ambition, transformation and mobilisation."